Facebook has announced that its Messenger app now has a video calling feature so that you can have face-to-face conversations with your family and friends. 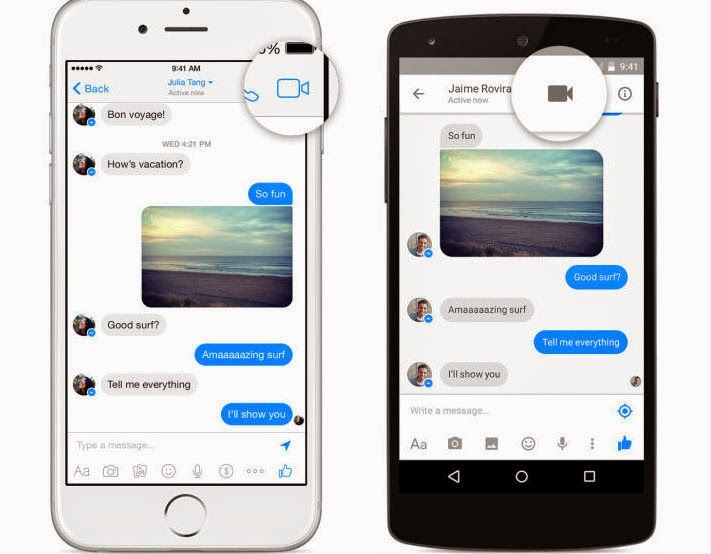 You can quickly start a video call from Facebook Messenger with just one tap. There is a video icon at the top right corner of the screen that lets you start a video call from within an existing Messenger conversation. When you start the video call, the camera will start in selfie mode and you can switch to the rear camera to change the view mode. Facebook Messenger’s video calling feature uses a small window that shows what your camera is pointing at, which can be dragged around. There is also an option to cut off the video feed on your end while still running the audio of the conversation. This feature comes in handy if the signal is repeatedly interrupted. Facebook said that its video calling service works between iOS and Android. Video calling on Facebook Messenger works through a mobile data connection and WiFi. This means that someone with a strong LTE signal on their iPhone in the U.S. can still have a video chat with someone in a third-world country that has a weaker 3G signal on their Android device. Facebook is also currently experimenting with group video calling and video stabilization, according to TechCrunch. This is not the first time that Facebook experimented with video calling. Facebook offered video calling through a partnership with Skype in 2011. Rather than depending on a third-party for a video calling feature, Facebook decided to invest in its own video communication infrastructure. The video calling feature definitely makes Facebook Messenger a worthy adversary against services like Apple FaceTime,Google Hangouts and Skype. The video calling feature for Facebook Messenger is currently available for iOS and Android users in Belgium, Canada, Croatia, Denmark, France, Greece, Ireland, Laos, Lithuania, Mexico, Nigeria, Norway, Oman, Poland, Portugal, the U.K., the U.S. and Uruguay. It will gradually roll out to other countries over the next several weeks. As of now, Facebook Messenger is currently used by over 600 million people per month.